The maximum occupancy is 2 persons including children of all ages. Violations result in loss of all deposits, immediate eviction and the loss of the ability to make any future bookings at this condo. The resort restaurant is closed indefinitely. However the resort lounge/bar is now open. This was a perfectly compact studio for a couple at a very reasonable price. The management was very responsive and provided very clear instructions from booking to the check in process. Don't be put off by the Murphy bed - it was comfortable and easy to pull down. It was nice to have a kitchen and washer/dryer (very helpful during the rainy season as the north of Kauai gets very muddy!). The only slight drawback was the lack of warm shower water which my guess is a function of the resort plumbing and not the specific unit. We enjoyed the resort and its amenities and felt the resort was nicely maintained without being cookie cutter. Be aware that the $20 resort fee which gives you access to resort amenities such as wifi, the fitness room, hot tub and pool, is separate than the stated price of the room on VRBO and is collected upon check-out. Our only negative experience with resort service was with the concierge who booked us a yoga class on the property but failed to inform us that the yoga instructor could not make it. A note on dining: the resort restaurant opens at 3pm so your breakfast options are nearby hotel restaurants (St Regis and Westin), buying groceries or grabbing food in the Princeville shopping center (<10 min drive) or Hanalei (<15 min drive). The restaurant is perfect for happy hour appetizers and drinks. Overall, we had a wonderful stay in Hanalei Bay and hope to return again in the future. Majestic mountain views of waterfalls and sacred Mt. Waioleole. A lovely retreat where you'll enjoy views of only jungle and mountains. Located in the Smallest Building at the Resort You Feel Like You have the Hanalei Bay Resort, if Not the Entire Island of Kauai, To Yourself. Studio 1-Bathroom Suite with Kitchen, Dining Area, Sleeping Area, Living Area, Laundry and Mountain View Lanai - 550 square feet of living space. The photos cannot capture how perfect this condo, and the property are - we would highly recommend anyone to stay here! We stayed here for 7 nights, and had plenty to do in the surrounding area. Perfect weather allowed us to stay in the area and use the beaches nearby for snorkeling and swimming. The condo had absolutely everything we needed for our stay, and enabled us to spend as much time as possible in the area. The Murphy bed was surprisingly comfortable, and the A/C and fans made for a very comfortable sleep. The bathroom was large and clean, with onsite laundry which was helpful. The front desk staff were incredibly friendly and the concierge was very helpful in suggesting surrounding activities. The room was updated and clean. It had everything we needed. Our views from the balcony were gorgeous. The resort itself was beautiful and worth every penny of the resort fee. The resort even offers a complimentary ride to and from the beach if needed. The beach was excellent for snorkeling and had amazing views. I thought Hanalei was the perfect spot in Kauai to get away from the more commercial areas to relax. Also, even with a resort fee added to the room price, I still felt like I was getting a great deal!!! I would definitely book this room again!!! We stayed in this condo for 5 days at the beginning of our trip and it ended up being my favorite place that we stayed on the whole island. The condo is beautifully done and has a phenomenal view. It was very quiet, yet had close access to the parking lot, pool and restaurant. The condo was well equipped with most things that we needed, which was very helpful. There are a few reasons that I did not give this condo five stars. Those are 1) we were not provided any salt and pepper to cook with (but other spices were provided), so we ended up purchasing our own 2) we were only provided one roll of toilet paper for our five day stay 3) condo is pretty much the furthest from the beach and the beach path is long and semi steep (there was a shuttle you could call, but when we did, it never came). Overall this condo was fantastic. I would love to come back for a visit! Thank you for taking the time to post a review from our request. The unit 1558 is a great and nicely remodeled unit and we are happy you did comment on it. The views are exceptional of the surrounding mountains! Typically the condo is supplied with 2 extra toilet paper rolls. We were surprised to hear you only had one roll of TP and wish you would have called so we could have brought you more. We are here to help. You mentioned the beach access which is a rare amenity in Princeville and this resort is lucky to have this great option. We do hope you can come again in the near future. Good view of the mountains (waterfalls if you look close) and jungle off the back porch. Great pool / hot tub. Princeville is total yuppie cookie cutter-vil, but, it is comfortable and easy! Hideaways beach is one of the best sunsets on the island and only a 15min walk away if you like steep paths. Decent snorkeling at Hideaways (better than the hotel beach down the hill). The North Shore is one of the prettiest parts of the island and we like staying up there, lots of beautiful beaches that require 15 min often steep hikes to access, and only ~ 1h from Poipu / the southern beaches and 2h from the west side / Polihale (another not to miss sunset - great camping). So any day it is rainy up north, you can hop in the car and hit sunny places down south. Be aware that there are a LOT of fees associated with resorts / rentals in HI. Everyone charges a cleaning fee (obviously a room needs to be cleaned after it is stayed in - separating the fee is good marketing, makes the price appear artificially low. They could charge $1 per night, then charge for cleaning, linens, trash, electricity, pool, key, wifi, front desk, etc). Advertised price probably 70% actual cost. Thank you for your time in posting a review for unit 1558 at the Hanalei Bay Resort. We are so glad to hear you enjoyed your stay, the location, the resort, the amenities and the beaches. It is a great location and so very beautiful! Quotes on our websites do of course included all the fees associated with a booking beyond the nightly rate for you to review before you book. This means you are very much aware of the cost before you reserve. For clarity, some of your comments and examples did not fit the model. Our costs include a nightly rate, a cleaning fee, taxes and a reservation fee. If you book on other booking sites besides our homebase site, they could also charge you a service fee which is paid to them. This property does have a resort fee and parking fee which is not our fee from the homeowner but from the resort which very reasonable in hawaii overall and is also disclosed before you make a reservation. For vacation rentals this is all very standard in which most people are aware of. This condo is clean and has a great location on the resort property. Quite and private! Close to stores. Make sure you bring your towels back with you from the beach and return to the desk when checking out. If you plan a Queensbath visit it is easier to leave your car and just walk there. Long walk, but no parking at Queensbath. I would definitely return to this condo! I checked the shower control and it requires turning the control knob clockwise to get super hot water. The condo has a large dedicated water heater so you‘re welcome to take long hot showers in the newly updated bathroom. This was a perfectly compact studio for a couple at a very reasonable price. The management was very responsive and provided very clear instructions from booking to the check in process. Don't be put off by the Murphy bed - it was comfortable and easy to pull down. It was nice to have a kitchen and washer/dryer (very helpful during the rainy season as the north of Kauai gets very muddy!). The only slight drawback was the lack of warm shower water which my guess is a function of the resort plumbing and not the specific unit. We enjoyed the resort and its amenities and felt the resort was nicely maintained without being cookie cutter. Be aware that the $20 resort fee which gives you access to resort amenities such as wifi, the fitness room, hot tub and pool, is separate than the stated price of the room on VRBO and is collected upon check-out. Our only negative experience with resort service was with the concierge who booked us a yoga class on the property but failed to inform us that the yoga instructor could not make it. A note on dining: the resort restaurant opens at 3pm so your breakfast options are nearby hotel restaurants (St Regis and Westin), buying groceries or grabbing food in the Princeville shopping center (<10 min drive) or Hanalei (<15 min drive). The restaurant is perfect for happy hour appetizers and drinks. Overall, we had a wonderful stay in Hanalei Bay and hope to return again in the future. The shower control can be turned clockwise to get very hot water. -The wonderful lanai -That it was located near the pool-The well stocked kitchen made cooking a breeze-Dishwasher-Very clean and comfortable-The shower -The wonderful jungle view-The beach and snorkeling -The resort as a whole blew us away! It was BEAUTIFUL! While the bed was fairly comfortable at first, the mattress bowed inward which made us both sink into the center of the bed and into each other. My only suggestion at all about the condo would be to get a foam mattress or mattress topper to help with this issue. Foam, even a 1/2 inch topper would help. I know the clearance with the fold up bed doesn't offer a lot of extra space to work with, but I think this would easily solve the issue. While at first it didn't bother us, after 7 nights my back hurt terribly. I'm in my 30's and I thought about trying to sleep on the couch the last night of our stay. With one person in the bed it's not too big of a problem because they would be nestled in the middle of the mattress but for two people...it was uncomfortable. This is my only critical feedback and the only thing that would make us hesitate about staying here for that long again. We are already planning a return visit to the resort because we enjoyed everything else so much. This small upgrade would have us signed up, in this unit, in a heartbeat to stay here again, possibly even twice a year. Thank you for a wonderful vacation and taking the time to read my feedback. We can't wait to return! Mahalo for your wonderful review and stay at my lovely condo. I’ve replaced the mattress in the Murphy Bed with a new, and very comfortable, 10” memory foam mattress - the old one was an 8”. To get hotter water in the shower, you need to turn the shower knob clockwise. After staying in a condo in Kapa'a for our first week, and being blown away by the cleanliness, organization, and upkeep, we were sadly disappointed in your condo. I dropped an ice cube on the floor, wiped up the water with a paper towel, and it was horribly dirty. We laid down on the bed, only to look up at cobwebs everywhere on the ceiling, lights fixtures, etc. I can guarantee that your dryer vent is not connected, due to all the lint, and the hot air you feel blowing up from behind the unit when you turn it on. The cabinet contents are tired, mismatched, and thrown in willy-nilly. I have pictures of cobwebs, etc., if you'd like to see them. We do appreciate your feedback and responding to our request for a review on the unit 1558 at the Hanalei Bay Resort. We are sorry that you felt the unit was not as clean as you expected and wish you would have contacted us so we could have sent someone by right away and attended to any issues you were concerned with. The stock of dishes in the kitchen might not be all matching but there is an abundance of dishes, glasses, bakeware, cookware and storage containers to meet all ones needs. We have spoken to the housekeepers about the cobwebs and to look out for them. With the vaulted/cathedral ceilings it does make it hard to always reach and do at times get special help to attend to those issues. Our housekeeping proceedures are kept to high standards with our crew spending more time than the typicial cleaning as found in hotels etc and we do have a inspector for each clean to follow up and make sure that things have been attended to properly. Thank you for letting us know about the dryer vent and we certainly will have the dryer pulled out to check the status of the vent. We like this condo. The price is good for what you get and its always very clean. The jungle view is pretty and seems a bit more private. Our only complaints would be the very firm mattress and lack of snorkeling gear. The room was super, clean and in order. The view was just what we wanted and the size of the studio was great. I would love to stay there again! Thank you so much for your great review! The studio is a great unit and with the full kitchen it is extra convenient. The view of the mountains is beautiful and we are glad you enjoyed it. We do hope you can come again soon! We loved staying in #1558 at Hanalei Bay Resort. The resort itself is sublime, especially now that the bar is open! The condo was very comfortable and incredibly well stocked with all the appliances and utensils you'll need during your stay, including bonus items such as cling wrap, coffee maker filters etc. It was a very large studio, the two of us could really spread out. And the mountain views were amazing. We booked our room at the beautiful Hanalie Bay Resort through Kristen Greene along with Christine Hurd of Aloha Condos. We had nothing but great service and response to all our inquiries prior to and our arrival. We booked condo # 1558 in the Haliconia Building. It was a beautiful little one bedroom condo with a mountain view and overlooking a lush valley of trees and vegetation. We were a short walk to the pool and lobby. Our room had everything we needed, fully stocked with all cooking utensils, glasses, plates etc. A great stove, coffee maker, microwave, dishwasher and a big fridge with an ice maker. The furniture was nice, the bed was a fold up murphy (wall bed) queen size and easy to lift up and away.. (very comfortable) making the room even bigger. There was also a washer and dryer in this unit. There were books and magazines and local guides. The unit was spotless and looked like it had a complete renovation makeover recently. The shower was amazing. The owner whose name is Jim, pretty well thought of everything for his guests. We even found beach chairs, a cooler and boogie boards in the back closet.We used Hanalie as our home base and travelled all over the island, lots of sights and many beaches. We totally enjoyed our time here and to top things off, on the day our flight was leaving for Canada, we realized that we weren’t flying out to11pm that night, but checkout time was 10 am Now the hotel allows you to pay a small fee and they will give you towels, use of the pool and a complimentary area room to change. Well when we enquired about this with Christine, they realized they didn’t have a guest coming in until the next day..they allowed us to stay until 3pm. Thumbs up to good people !!. We have been home a week and already we miss those wonderful breakfasts and late night glasses of wine on the lanais. I live on Kauai, and was trying to find an affordable spot for a staycation. This unit is so roomy even though it's a studio. It had everything we needed to enjoy a day grilling out with our friends as we celebrated my husband's birthday. They even had chairs and boogie boards! I will recommend this place to ANYONE staying on Kauai, thank you so much for making this location affordable and charming. My Boyfriend has been to the Island many times, this was my first trip. I have to say we had a great time! The Condo is just what it said it was. Not a lot of time was spent here but it is a good home base. We hit costco for our food and the kitchen provided all the comforts of home. Would have been nice to visit the restaurant or bar ( both under construction- so no night fun) But with all the day trips I have to admit that was ok. I was not to happy with the non heated pool the cold dip is not for the faint of heart. But I would recommend this place to a friend in a heartbeat. We had a wonderful stay in 1558. It had everything we needed and was conveniently located. The resort was lovely and everyone was so helpful. The view from the lanai was amazing and we loved going out each morning to see the mountains and beautiful greenery. We will be back! We are so glad you will be back! Thank you for taking the time to post a review. This is a great studio condo with a full kitchen for convenience! The views are pretty special of the surrounding mountains and waterfalls from the lanai. This unit is actually currently in the process of a huge remodeling project. Therefore the next time you come back, it will be even better! We are glad you enjoyed the condo and the beautiful resort. Everything was fine except the air conditioner did not work and it was very hot in the condo during the whole stay. Granted I keep my house at 67 but this was just way too hot for me. Thank you for taking the time to post a review for your stay at the Hanalei Bay Resort unit 1558. We are so glad to hear that you liked the unit but are surprised to hear that the air conditioner was not working. We are very responsive and diligent about any malfunctions in any of our units and wish you would have called us to let us know about the air conditioner not working. We certainly would have sent someone right away to try to remedy the situation. We have had other guests in that condo since your departure and they have not called about any issues with it. It was extra hot this past season and air conditioners were working overtime so we did have other units that did need attention which were taken care of. Great Stay at Hanalei Bay Resort! Great condo with a fantastic view of the mountain and waterfalls! This condo came stocked with pretty much everything we needed. It was great to have a full kitchen and washer and dryer on our trip. It was very nice to have air conditioning in the condo. The resort is very nice and quiet. This condo has an adjoining door to the unit next door - not a problem for the most part but we could hear our neighbors at times, but nothing too disruptive. The lock on the doorknob was INCREDIBLY hard to get to work. It took us usually 1-2 minutes each and every time to get the door unlocked. I would suggest at least replacing the lock or even upgrading the doorknob/lock to the kind where you just punch a code in. Also, we had a bit of a spider attack on our last night there. Tons of tiny little spiders invaded the condo at the front door area. I understand it’s the tropics, but maybe including some bug spray or possibly setting off a bug bomb would help :) We couldn't have been happier with the condo and the service from the rental company! Overall this condo had EVERYTHING we needed. Only three suggestions. The first is to install another AC unit or a stronger one. The second is to fix the lock on the front door. The third is to fix the bed legs that trigger the murphy lock. Otherwise it is perfection! Everything we expected. Great deal! Great Studio in a great location, bed was extremely comfortable, the patio was perfect for breakfast and relaxing! It's nothing fancy or luxurious but it fit our needs for the price perfectly. This little condo was perfect for our honeymoon stay. We stayed for 10 days in March and it was amazing! Loved waking up in the morning and making breakfast to eat on the patio with the most amazing waterfall views! The bed was comfy, the kitchen provided everything we needed and there were even beach chairs in the closet! Hope to be back again soon! Be sure to sit on the hill by the tennis courts at sunset AMAZING! We loved our stay in this condo. Although we normally select an ocean view we thoroughly enjoyed the mountain view. It was great to have all the cooking facilities and washer & dryer.The resort is beautiful. Ideal location for exploring the Hanalei Bay Area. We wished we had more time there and would definitely return if we have the opportunity. Thank you for your great review! We are so glad that you found the unit to be very accommodating and that the mountain views were very serene. We are also glad to hear that you hope you come back again and enjoy another stay. Mahalo for your business! Absolutely perfect for our small family. The condo that we stayed in was just right fort small families needs. The view of the mountain from the Lanai every morning was incredible! We really enjoyed having breakfast with the birds every morning. Hanalei Bay, Kauai is the most beautiful place we have ever visited (and I've traveled all over the world). The resort is top notch as well. I highly recommend this area and condo for any couple and/or small family. Perfect! 1. 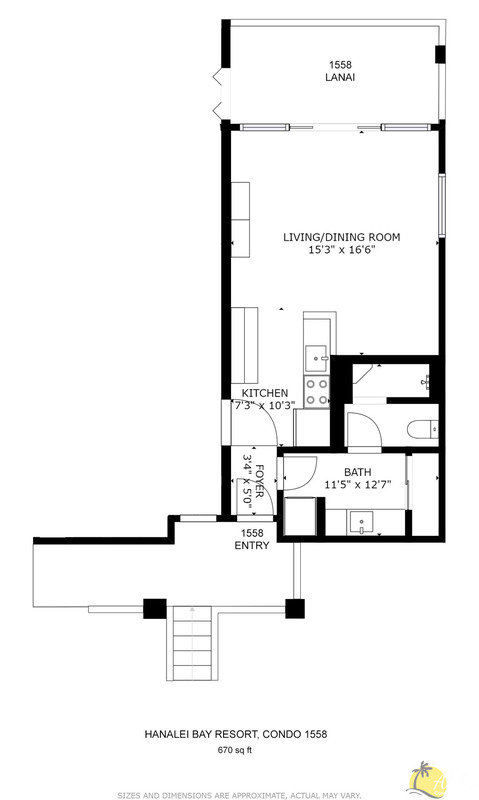 Condo - The condo, a studio with Murphy bed, a full kitchen, and a washer/drier was great. The large balcony looked out onto the mountains, an unbelievable view. At first I thought an ocean view would be preferable, but this view was the best. Another advantage of this unit is that it is in a very private area in the complex, yet less than a two minute walk to the pool. The bed was extremely comfortable, and the full kitchen and washer/drier made a big difference. The only issue with the unit was that the latches on the Murphy bed were a little temperamental. However, not a big deal. 2. Beach - One of the few north shore resorts with its own beach. It is a steep walk down and a seemingly steeper walk back up. However, there's a phone at the beach to summon a golf cart for the ride back. We never waited more than two or three minutes. The beach was beautiful. Shares the beach with the five star St Regis Resort. 3. HBR - Great resort. Best pool/spa west of the Yacht and Beach Club at Disney. Lots of chairs and shade. Really a fantastic place to spend an afternoon or evening. The complimentary Happy Hour on Wednesday was a nice surprise. Spa area was wonderful. Well done. The only shortcoming at HBR was the lack of a restaurant/bar/snack bar. Fire several years ago destroyed the restaurant and rebuilding has been slow. Lots of tennis on site and great golf minutes away. We loved our stay in unit 1558 in Hanalei Bay Resort. It had so many extra little things that made it feel more like our own private cabin than a unit in a big resort. Pros: - Lots of extras - Beach chairs and a cooler were awesome to have. Explore all the drawers and cabinets...haha. - The patio was huge and the view was amazing. Only a power pole and glimpse of roadway give away the fact that you are not in a completely isolated jungle valley. - The free-form pool at the resort was absolutely incredible. We used almost every day. The waterfalls and sand bottom hot tub just made it so unique. It was rarely busy...even when they were giving away free Mai Tais & hotdogs (one time thing), we got a chairs. Best time to swim there is after dark though. - Called the owner of our unit to ask for a later check out, hoping have another hour so we didn't have to rush out in the morning. He said we could stay until 6pm! It was like having an extra day for free. Cons: - Need to finish those renovations and get that restaurant done. - Long 'hike' to and from the beach. We only went down once. The resort will shuttle you though. - The unit needs a little bit of work/cleaning. In particular, the water/ice dispenser in the fridge was visibly dirty (didn't use), the Murphy bed barely stayed closed (one latch damaged), A/C had trouble keeping up and shower could use an upgrade. This stuff didn't bother us though, but if you are an uptight traveler expecting 5 star accommodations for minimal $$$, you might have issues. One thing to be aware of is that if you stay on the North side of Kauai, you are going to be doing a fair bit of driving if you want to see the whole island in one trip, like we did. Takes about 1.5-2 hours to get to the south side, depending on traffic. Overall, we really enjoyed our stay at Hanalei Bay Resort and would definitely recommend it to anyone looking to stay on the North side of Kauai. When the restaurant and renos are complete, it will be a top notch resort. This studio condo was well equipped. Quiet! Very comfy bed. I love the HBR pool and jacuzzi. The grounds are beautiful. There is beach access although it is a public beach so no amenities.And a cart that takes you there. There is ongoing construction but I was there on a weekend and it did not affect me. I would definitely stay there again! And I am a resident of Kauai. We stayed for 10 days at the Hanalei Bay Resort. The location is the best for enjoying the north shore activities. You can walk to several beaches, including Hanalei Bay. You can also walk to Queens Bath and Hideaways. This is also a short drive to several other north shore sites. The Hanalei Bay resort pool is wonderful and there is a great spot for watching the sunsets. The construction did create a few inconveniences, but it wasn't too bad. At first I didn't like the fact that you cannot park by the room, but for unit 1558 it wasn't too far. The property charges a $12 per day "resort fee" (and this is soon to be increased). Supposedly it covers towels, internet, tennis courst (which we did not use), and some other items. This should be considered as part of the daily rate. The unit 1558 itself was nice. We really liked the location on the top floor. The bed was comfortable, and the kitchen was pretty well furnished. There were some pots and pans that were not usable because they were rusted and should be replaced. A few areas that need attention includes the floors and rugs - they didn't seem very clean. The AC unit did not seem to always reach the bathroom, so it would stay hot in there. The shower head looked very old and had hard water deposits on it. Overall we enjoyed the stay though. Mahalo for choosing to stay with us at Hanalei Bay Resort 1558. We truly appreciate all your feedback and have already replaced the pots and pans, shower head, and treated the area rug. Unit 1558 is a unique condo because it offers a full kitchen and washer/dryer at a studio rate. In addition the views of the waterfalls off Namolokama mountain are simply breathtaking. Only a select few condos at Hanalei Bay Resort can say the same. This condo has a brilliant view of the mountains. My wife and I stayed here on our honeymoon as the first leg of our Kauai vacation, and it was perfect. The location is near so many wonderful things to do on the north side of Kauai, and the grounds were beautiful without being garish. The condo is well-maintained, clean, and very comfortable. We found everything we needed in the condo, everything worked.Ac, W/D, full size stove etc. were right on spot.The walk to the beach is quick even without a pickup by golf car from the office. This was my wife and my self's first stay at this resort and we had pleasant time. Condo 1558 was a nice cozy room for two with all the small amenities that you would hope for, the wireless internet and cable was working well and came in handy when relaxing in the room. The views into the rain forest, the soft comfortable couch, and climate control aC were all selling points for me. My wife thought the bed was a little firm for her liking and the water pressure in the shower was weak. We also ran into some large sized spiders in the room, but I'm pretty sure that's hard to avoid on all parts of the island. The resort provided a great pool/hot tub area that was a very short walk from the room and had some cool waterfall features and landscaping. We spent many hours in this area, but it was really lacking in the bar/drinks department, which was slightly disappointing. The resort also provided golf cart shuttle services down the hill to the beach, which made the hike a little easier. The resort staff were all really nice and helpful and I'm sure had to work a little out of their comfort zone because of the renovations that were going on at that time throughout the complex. We also wish there would have been a small general store of some kind close by, you really need to stock up on supplies before you show up, although you can find a store that is a 10 min. drive away. We didn't participate in the tennis, but we would see how that could be a selling point for someone else, they had lessons going on every day nearby our room. We also had a daily dose of rooster calls every morning, so we learned quickly to shut the slider door at night if you plan on sleeping in. Overall it was a good experience and most of the cons listed are all small nitpicky things, especially considering the low cost of this condo rental compared to others in the area. We would for sure recommend this to a friend and hope to come back in the future. Wonderful stay in Hanalei Bay Resort Condo 1558! Taking a moment to follow up on our recent stay at Hanalei Bay Resort Condo 1558 - the unit exceeded our expectations and was better than advertised! From a fully stocked kitchen, a wealth of reading material on the island, and the friendly resort staff we didn't want to leave. The 'small town' feel of Hanalei Bay is something special, can't wait to return! Waking up everyday just before dawn breaks to the the sounds of nature, to cool & misty tradewinds, sometimes to trickles of liquid sunshine; having a hot cup of freshly brewed locally grown coffee; having al fresco breakfast of hapa rice, spam, limed papaya, juice of blended fruits, with our morning visitors of birds & chickens; having your own stretch of beach to laze versus fighting for your spot in any other beaches; finding every excuse to chase the rainbow at the 1-lane bridge at Hanalei; feasting on the freshest cut of fish bought from Blue Dolfin; being the canvas of Uncle Tim of Blue Hawaii Tattoo...what's not to love about being in Kauai? Oh, if only we can do this everyday! Excellent condo. My wife and I have stayed in this building twice now. It is the perfect getaway. Beautiful, quiet and clean. The condo is not on the beach but has an amazing view of Hanalei mountain. We will be back for sure. The only issue with this condo is that the bed is not that comfortable. It is not that bad but could use a memory foam or mattress upgrade, otherwise perfect. Aloha Dustin - thank you for the feedback. A new memory foam mattress has been ordered and will be installed next week. Again, thanks for the help. Spent close to two weeks at Hanalei Bay Resort #1558... The unit is wonderfully situated, on the outside edge of the condo complex, overlooking some jungle bush and trees, close to the trail down to the beach - and very close to a couple of sets of tennis courts! - marvelously peaceful and quiet. The unit came with all mod cons, including a full set of kitchen tools and a complete range of spices! Savvy travelers will appreciate the shortcut to parking spaces just off the main lobby... a two minute walk to the condo... Probably the biggest surprise was the simplicity and clarity of the snorkeling at the beach... despite being "North Shore" and winter - walk in and you're there. I've been to Kaua'i many times but never had the opportuniy to stay in Princeville. What a way to to make an entrance. Hanalei Bay Resort was exactly what the Dr. ordered. The meandering pathway to our condo might prove stressful to some, but there's no shortage of golf carts and friendly employees to bring you from the parking lot to your condo or to the fantastic beach that awaits beneath you. Condo 1558 is perched hi up the hill near the service entrance, arduous journey for some, but once there you will be immersed in stunning, lush foliage with spectacular mountain views. I still wake each morning and think about waking to that view. The lanai is simply a mini oasis. The condo itself has every convenience imaginable and it was a pleasure to do laundry & make our own meals and enjoy our blender sunset cocktails from our lanai. The murphy bed is a great space saving idea but it was my only mild complaint. I wasn't sure if I awoke earlier and earlier because of the thin pillows & firm bed or my own excited anticipation of watching another sunrise from the lanai. Regardless, I can not wait to return to condo 1558 in 2013. Attention tennis players..there's a superb tennis facility just a fer buildings from the condo with a great instructor and daily morning classes & afternoon mixers. Better than we were looking for! This condo is lovely, clean, with plenty of amenities, a fully stocked kitchen and the best mountain view ever. We loved making breakfast and watching sunrise over the mountains. The foldup bed was a little stiff, which some people love, we were indifferent. If you are looking for an affordable room for 2 with all the perks of home, just book this now! Just spent a week at Unit 1558 Hanalei Bay Resort, Kauai. It worked perfectly for my wife and I. Its compact kitchen is very well outfitted and allowed us to cook anything we wanted. There were some units that had been updated with granite counter tops, stainless steel, etc. but this one had the complete kitchen that meant a lot to us. It was very well maintained, clean and cared for. The Murphy bed worked out great. It is very comfortable and large (queen I think)and very easy to use. We liked having the extra space when the bed was not in use. We were quite impressed with the management. One day we got new next door neighbors. They had two children who were very noisy and woke us up at 5:30 am. We called Jim and he dealt with it decisively and quickly. There were only supposed to be two adults in the unit according to their contract. They were told to leave immediately and they did! It was back to paradise for us. The unit had just about everything stocked you would need for a vacation to Kauai. There were even beach chairs, binoculars, guide books and a gift basket upon arrival. But the best of all was the view and the seclusion. The lanai was an extremely pleasant place to have leisurely meals while enjoying the view and the many birds. The views were looking back toward the island. A beautiful jungle was in the foreground with spectacular mountains in the background. The booking process was easy and the staff were all very helpful. For Unit 1558 we had the option of a close parking space with a path that included the service area, a garbage collection area and construction site for the new restaurant. Or we could park in the central parking lot and have little longer walk but a more genteel path that included walking past the swimming pool and tennis courts. We tried both and ended up taking the short one most of the time. Overall, our expectations were greatly exceeded and I practically had to drag my wife out of the place! We had a wonderful 4 days at the condo and liked the amenities of it and the service. Aloha Condos provided us with everything we needed. We especially enjoyed the informative books and the beautiful views from the lanai. Too bad there was no resaurant or sundries shop due too the fire, but there is this delicious Thai restaurant in Hanalei that's well worth the drive. We hopefully can stay there again. Stayed in Hanalei Bay Resort and will definitely recommend friends and family members. The condo has full facilities. The washing machine and fully equipped kitchen makes staying so easy and pleasant. We do not need to rush out to find food. The scenery is also spectacular. So peaceful and I think Princeville area is a great place to stay. Thank you. Condo is well organized and maintained. Washer/dryer in unit very helpful. Extras like beach chairs and cooler provided. No problems. Wonderful location and the condo had all we needed! The condo was very "homey", the location was perfect and the price was such a great deal- we loved everything about it! I loved everything about the condo - the view, the washer/dryer, the kitchen. Perhaps the mattress could have been a bit more comfortable, but that is most likely just the nature of a murphy bed. Overall, a very comfortable place to stay. Thank you! great value for this studio with a full kitchen. The hosts provide everything you need to enjoy the beach (chairs, cooler, etc) and all the cookware if you want to eat in. while it doesn't have an ocean view, the lanai has a very nice mountain view and we spent many hours enjoying our meals and reading outside. the only downside I can think of is that it has a murphy bed which isn't as comfortable as a real one. It was fine for me, but more sensitive folks might want to consider this. The resort is also great, they drive you down to the beach whenever you want and provide beach towels you can use for the pool and beach. It was a very relaxing vacation at a reasonable price. thanks aloha! A great time in a great place. A lovely little studio with vaulted ceiling and full kitchen. Good view and we appreciated the feeling of privacy from being away from the other buildings. Amenities were plentiful, complete with two boogie boards! Thanks for the wonderful stay, I wish I was there right now! I was slightly skeptical about this unit when I booked it because the price was so reasonable and I wasn't sure about staying on a murphy bed. However, I was so pleased with what I found. The pictures accurately represented the unit, and actually the unit seemed a bit bigger than shown. The murphy bed was comfortable - I was really surprised. I slept well and it was easy to put up and down. The living space was well laid out, comfortable (I napped on the couch twice in 4 days), and felt homey. The view from the lanai was beautiful and allowed me to see the beauty of Kauai from the unit. The kitchen was well stocked. I ate in and packed lunches and the kitchen had all the pots, tupperware, and gear you could want and need. The bathroom was a girl's dream. Large vanity area with drawers for my stuff and a separate room with the toilet and shower. The quickest way to the unit from the parking area is by passing the complex dumpsters, which is not pretty but frankly, I didn't care. And, if you didn't want to see dumpsters, you can go the long way. I didn't find this to be any sort of problem. Finally, the owners / management company were very responsive as I asked questions prior to and after booking. If I return, I would stay here again and if I come with my family, I would look into booking 1558 and the companion unit, 1557. We had a great time at the condo. It was clean and the furniture was comfortable. The view from the room was spectacular as well. The kitchen amenities were also great and allowed us to cook instead of having to to go out to dinner/breakfast every night. I would definitely recommend this condo to others.